Currently, Polaris (Alpha α UMi) shines at magnitude 2.0 and lies just 0.7° from the North Celestial Pole (NCP). Precession of the Earth’s rotation axis will bring the NCP to within 0.5° of Polaris in March 2100, its minimum distance. The situation for the South Celestial Pole (SCP) is not such a happy circumstance. The nearest naked-eye star to the SCP at present is neither near nor bright. Sigma Octantis at magnitude 5.5 is not easy to see with the unaided eye, and being 1.1 degrees away from the SCP doesn’t win it any awards. Besides, precession is moving the SCP farther away from Sigma Oct, not nearer. So, around 8100 A.D. Iota Carinae and around 9220 A.D. Delta Velorum will serve admirably as southern pole stars every bit as good as Polaris does now in the northern hemisphere. 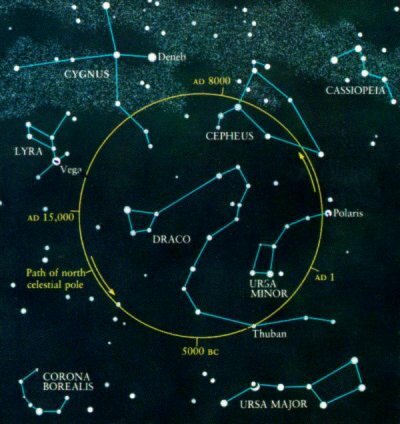 Up until the year 10,000 A.D., no northern pole star will be as good as Polaris is now, though 4.8-magnitude 9 Cephei will be very close to the north celestial pole around 7400 A.D. Thought you might enjoy seeing what deep sky objects will come close to the celestial poles, so those are listed in the above tables as well. Next Next post: Iapetus – Wow!